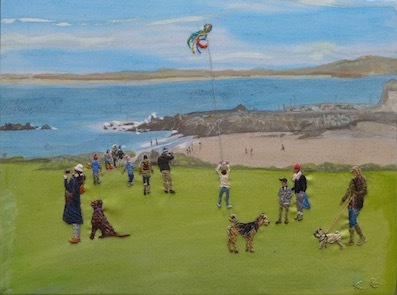 Last year I was invited to take part in Sarah Adams’ wonderful 10th year anniversary show at her Padstow Studio. 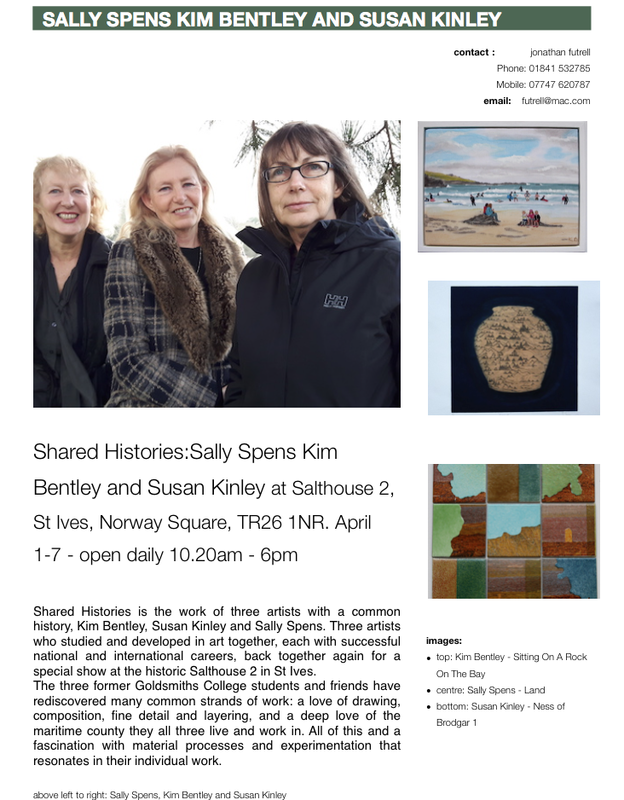 My contributions were these three images – all sold: On Stile Selfie; Paddling Pooches; Sitting On The Rock On The Bay.The preview was wonderful event with many of Sarah and my own clients making the time to share the occasion. 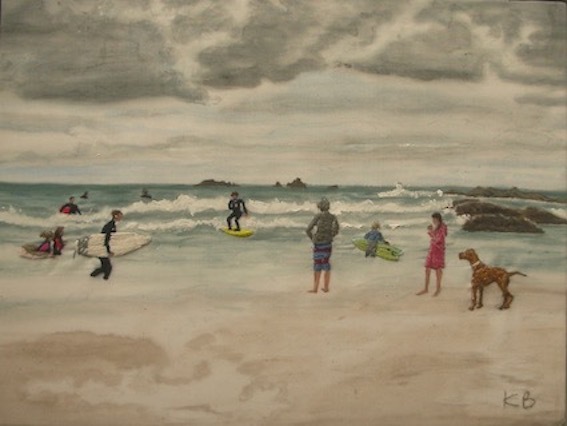 I am delighted to announce there is a second gallery (after the Fowey River Gallery) showing my work on Cornwall’s south coast. 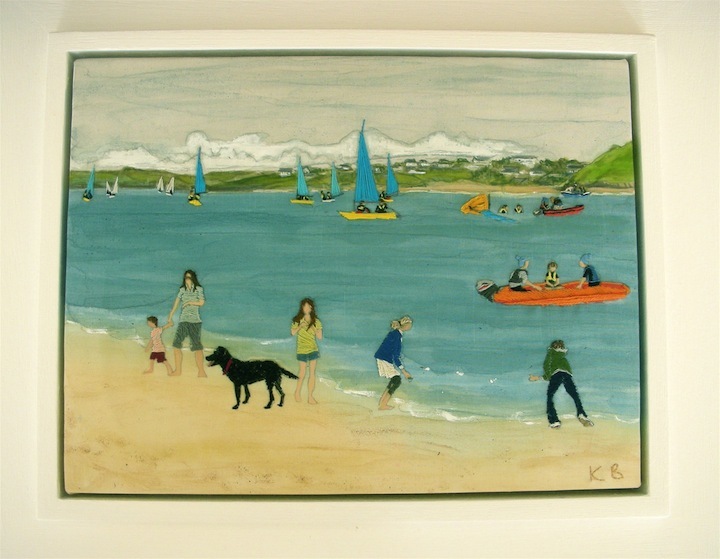 It’s the Square Gallery, right on the seafront, close to the harbour, at St. Mawes. 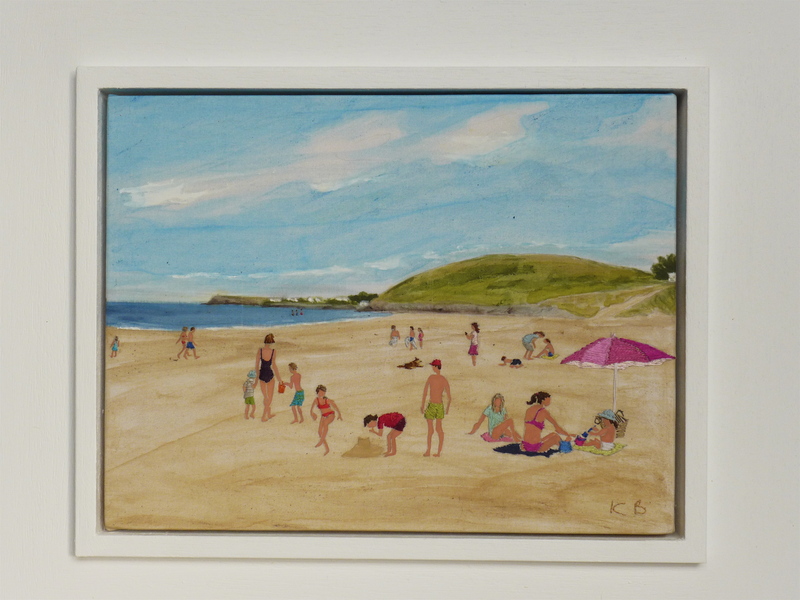 It’s a wonderful place with work by dozens of great artists including my friend, and design partner Sally Spens. 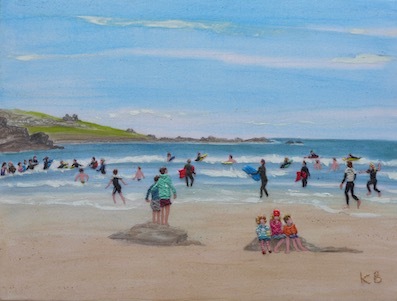 It’s a small and bursting at the seems with great contemporary art work and is run with contagious enthusiasm by Catherine Talbot, whose love for art and support for artists is refreshing and encouraging. 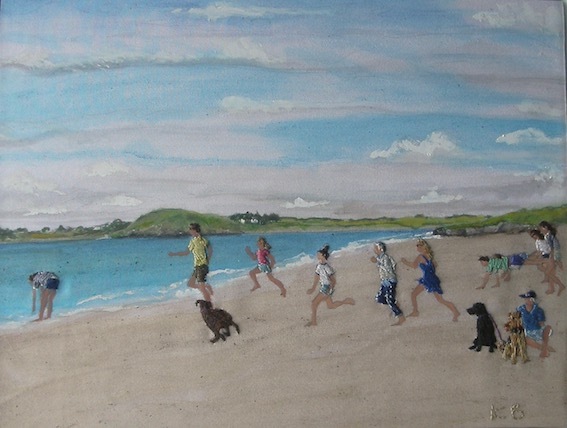 To begin with Catherine is showing four of my embroidered paintings; The Beautiful Game In Battersea Park, and Cornish beach scenes Jump For Joy, Sailing School, and my latest, Winter Quick Step, a chilly out-with-the-dogs and wrap up warm sort of day, that for me could be almost morning walk on the beach between November and March. 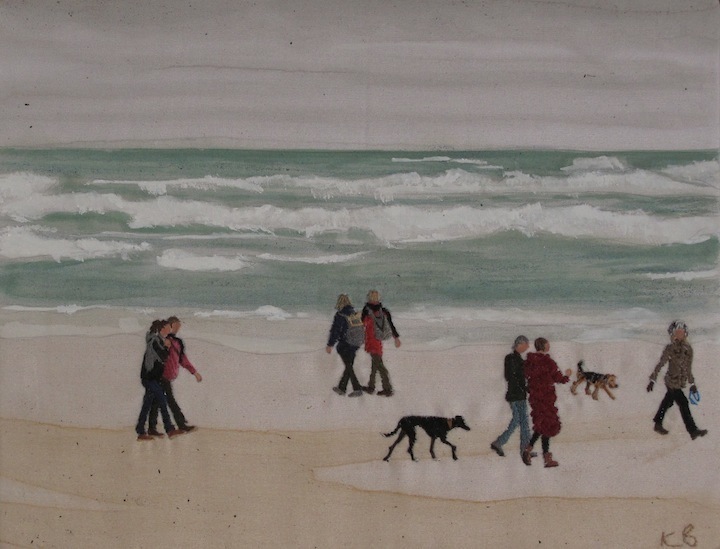 Asta and I have been scoping out the area and there will embroidered paintings of St.Mawes in the near future. 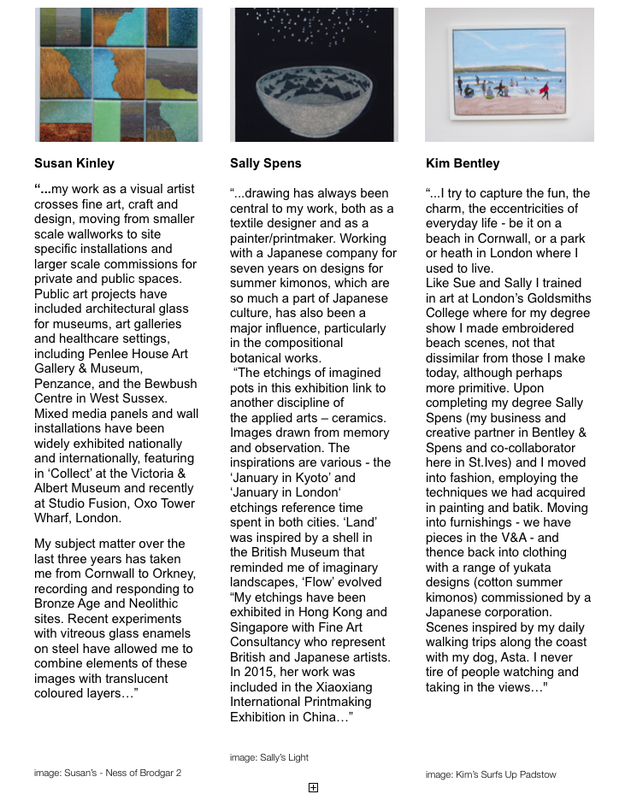 If you get a chance take a look at the Square Gallery. 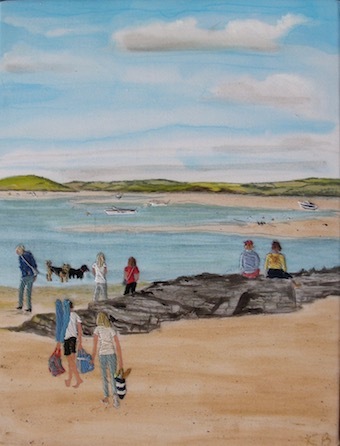 There’s lots to see and a great pub with huge servings of fish ‘n chips, across the road, The Rising Sun. 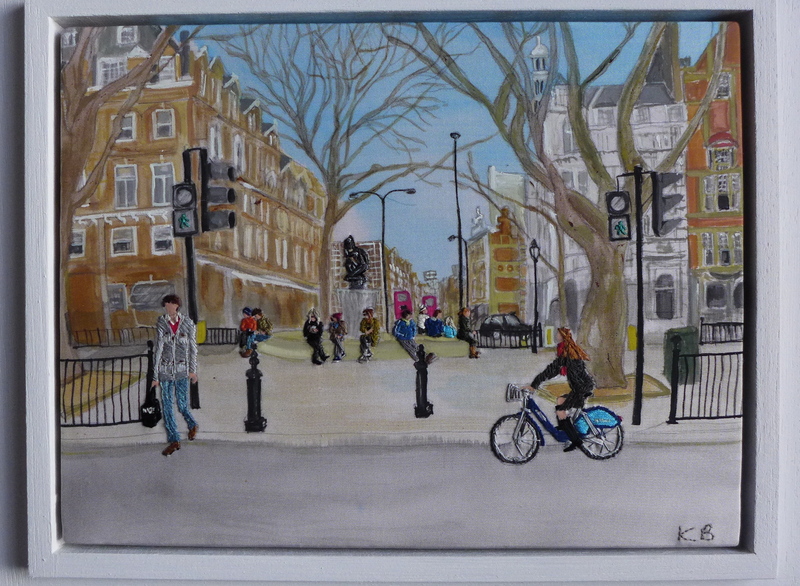 I took a break from west country beach images this month and devoted my time instead to a brace of London works. With the football season in full swing The Beautiful Game In Battersea Park is a painted and embroidered snapshot of footie on the banks of the Thames. With Battersea Power Station in the background, and Asta Puppy looking at something in particular, parents watch on as the young blues look to be getting the better of the young reds. Not so far away is Peter Jones, on the Kings Road, where I worked in the haberdashery department for three months after leaving Goldsmith College. I’ve always loved the flower stall on Sloane Square and enjoyed quite a few lunch breaks on that bench. I’ve tried to capture west London style; there are Chelsea ladies buying flowers, another talking on a mobile, and fashionable west Londoners going about their business. 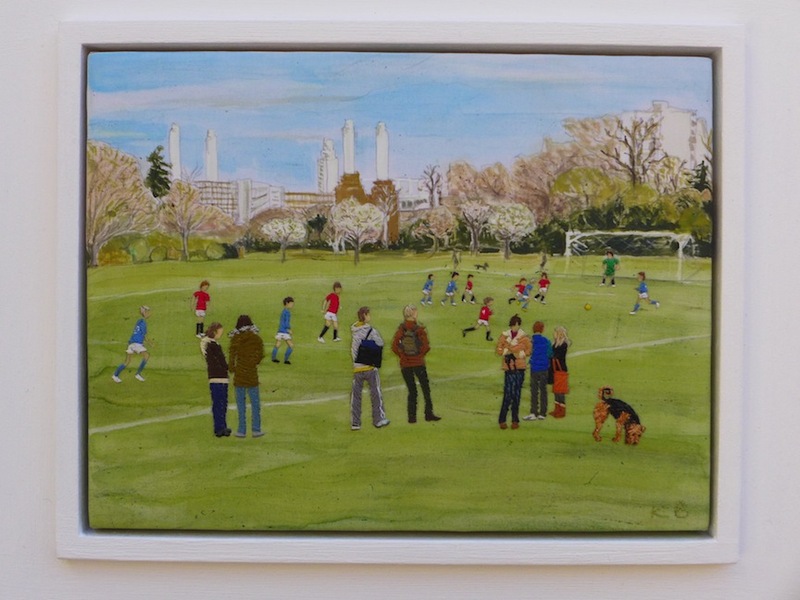 ‘The Beautiful Game in Battersea Park’ and ‘Flower Stall On Sloane Square’ are framed and ready to go; £620 each. 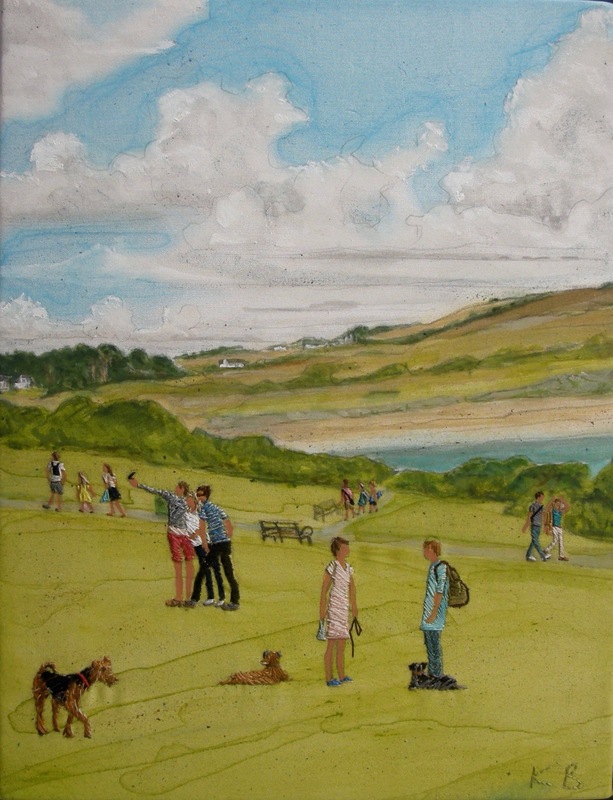 Last year I adapted my painted/silk taffeta Cornish beach scenes to encompass London’s Parliament Hill and Hampstead Heath. 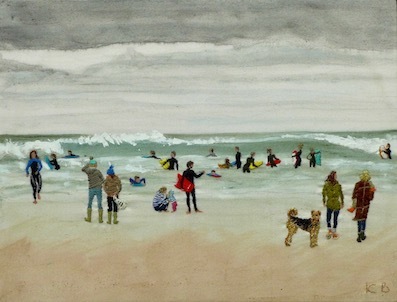 This month much of the work I am showing at Art’s Blooming Marvellous, at Battersea’s Affordable Art Fair (March 13-16), has a south west London feel. 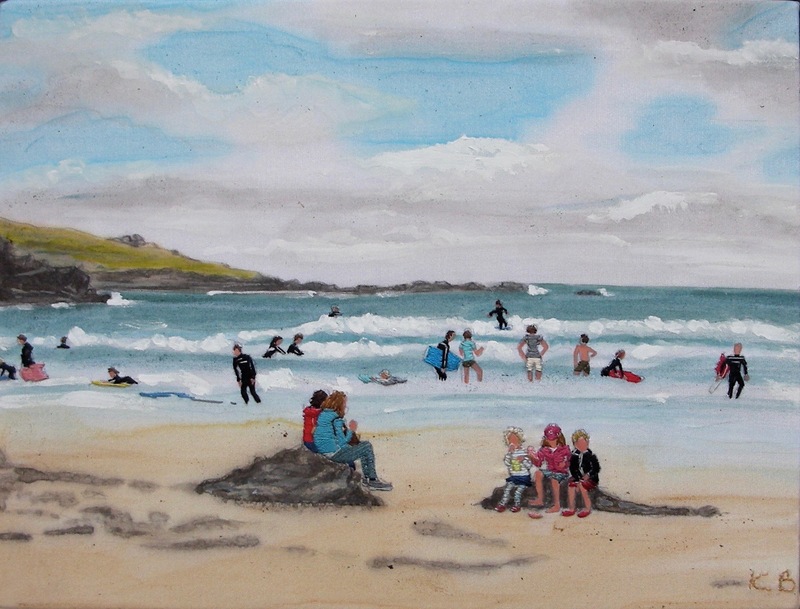 I will be showing on the Beyond The Sea Stand, belonging to a Cornish art company with galleries in Padstow and St.Ives. 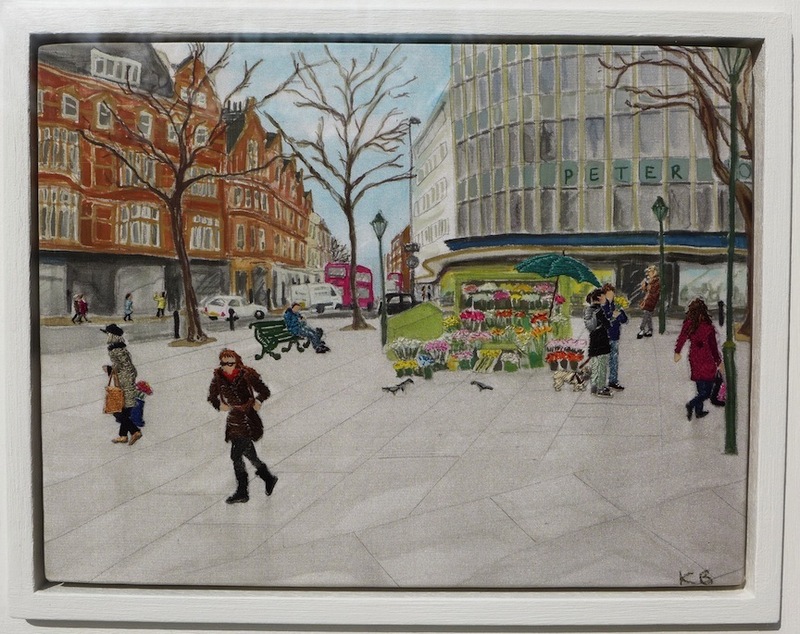 Of the five new London images on show are ‘Coffee Break With Venus On Sloane Square’, that is just what it says; looking north along Sloane Street with buses and taxis, cyclists, walkers and a group of people sat around the statue of Venus. 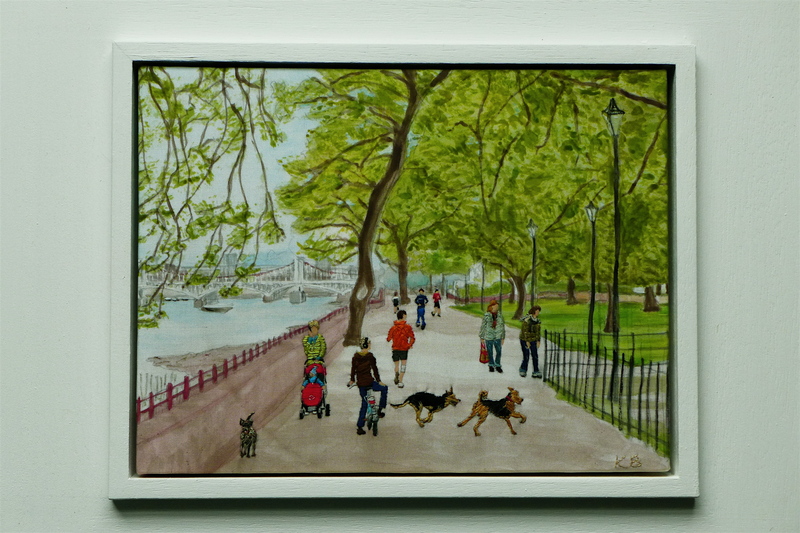 Another is ‘A Spring In Their Step In Battersea Park’, looking west along the embankment with Chelsea Bridge in the distance and a cavalcade of joggers, cyclists, and dogs. 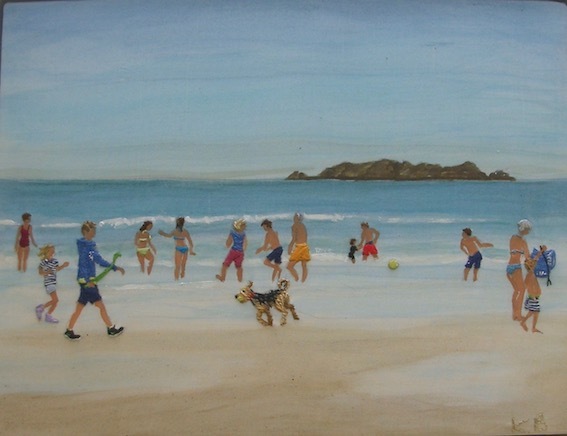 You don’t have to look far to find Asta. 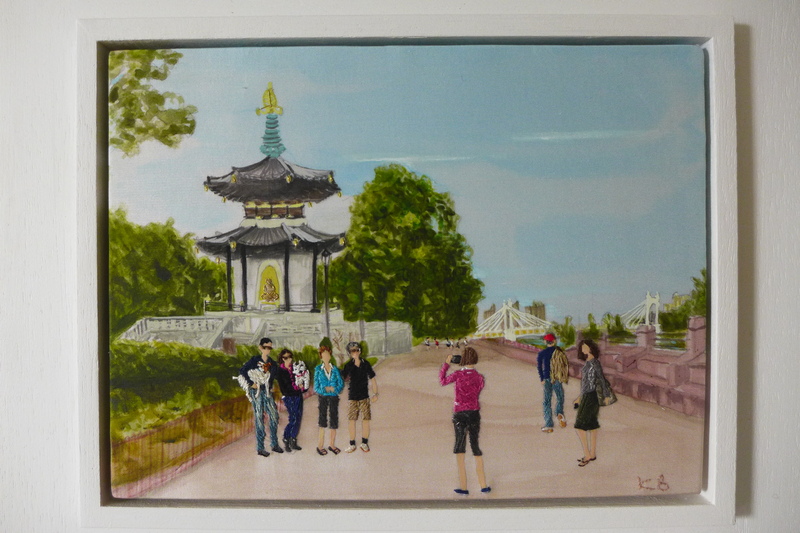 Then there is ‘Posing At The Pagoda’, depicting the same spot but facing the other way, with the Albert Bridge in the distance and, a golden Buddha and a family posing for a photograph – on an iPad. 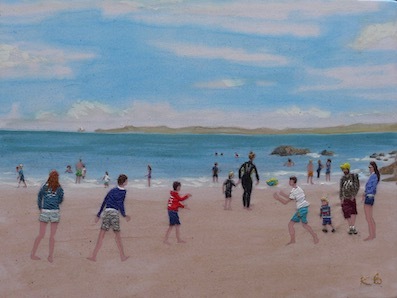 This three (and they may be more, I’ll have to wait and see) will be joined by three more familiar Cornish scenes: ‘Snap Happy On Constantine Beach’; ‘Jump For Joy’ and ‘Summer Days At Brea Hill’.